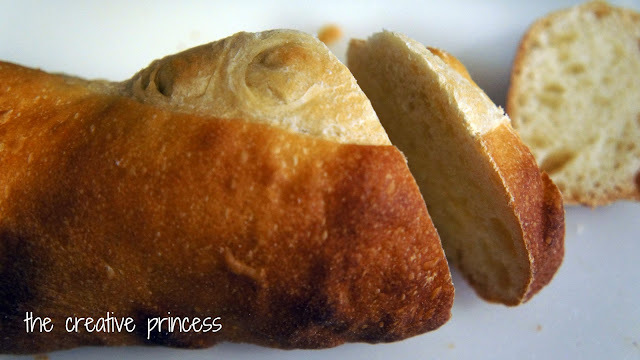 Last week when I was trying to come up with something to pair my Ecce Panis bread with I immediately thought CHOCOLATE! I had NO idea how I was going to make this work. Should I make a chocolate spread? 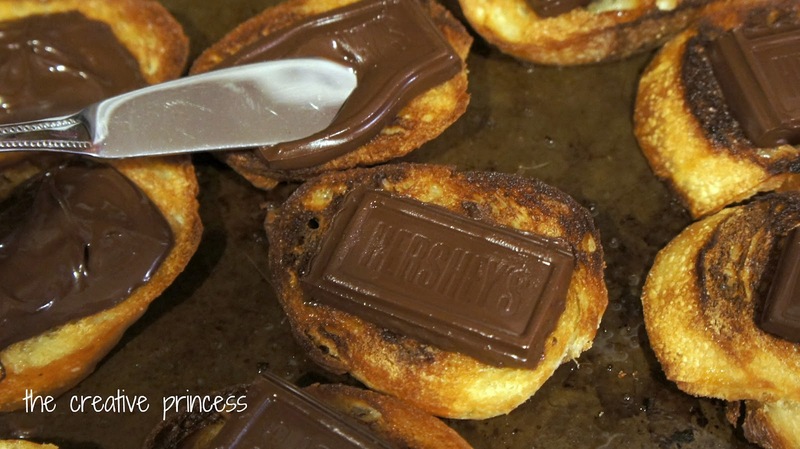 Dip the bread in chocolate? What? THEN! After absolutly NO results on this from Pinterest (I know! I was shocked also!) I turned to Google. That is where I found this recipe. 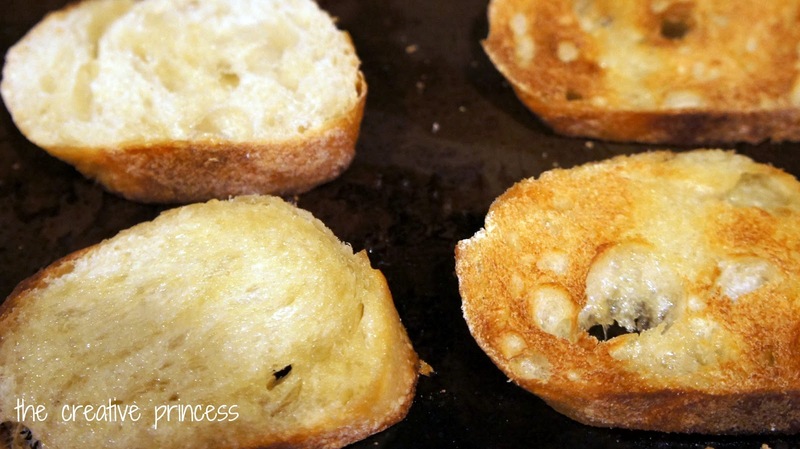 Savory Chocolate Sea Salt Crostini! WOW! I told hubby about it and the first thing he said......"you should top it with bacon"! The man is a genius I tell you! So after looking through our fridge and both freezers I was at a loss....no bacon. *sigh* I decided to just make it as the recipe calls since this would be my first time to make it and I still was not sold on the whole bread and chocolate thing. I mean, I knew it would be good because well Ecce Panis bread is AMAZING and chocolate is well....chocolate! Hello! 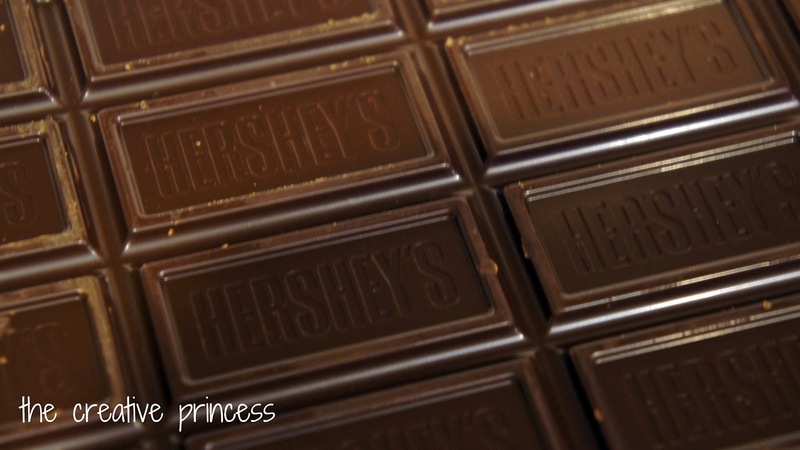 Can't go wrong with chocolate! The first thing you will do is slice your bread. You want thin slices but not too thin, I like to cut on the bias. You can say bias in cooking....right? Or is that just sewing? Oh well, it works here. All my pretty slices, just a few more cuts to go. 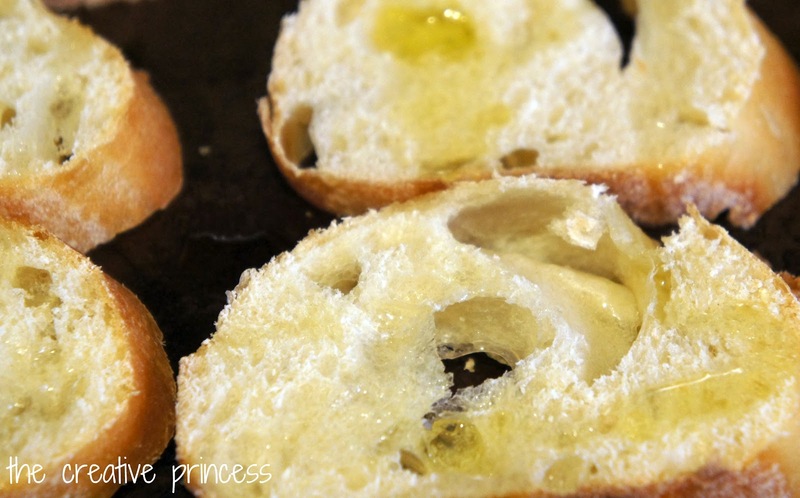 Place your slices in a single layer on a baking sheet and drizzle with olive oil. You will then place the baking sheet in the broiler for a few minutes, just enough time to allow the bread to become golden brown. Once your pieces are a golden brown, remove from oven and flip over and place back in broiler for a few more minutes. While your bread is in the oven for the second time, take your chocolate and break it into pieces. When your bread has browned on both sides flip it back over to original side and slightly push one piece of chocolate into center of bread. Turn oven off and place crostini back in oven for just a few seconds to help melt the chocolate just a bit. I did try to allow the crostini to just sit on the top of my stove for a few minutes and see if the chocolate would melt that way, for whatever reason it would not melt and needed the extra heat from the oven. 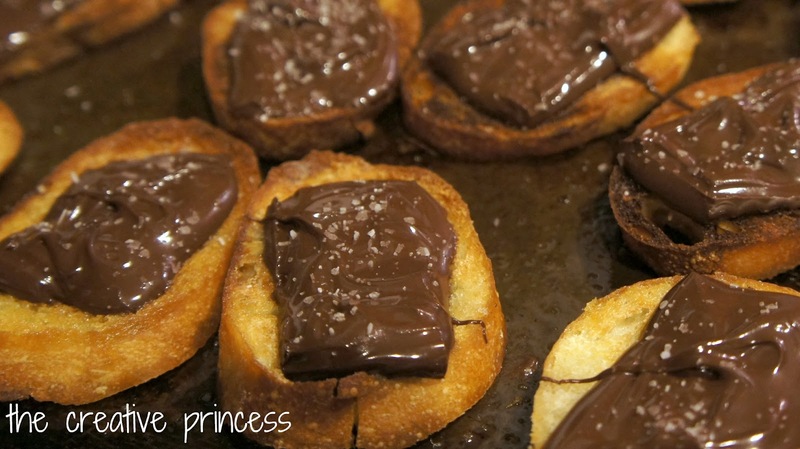 Once the chocolate was melted a bit I spread it over the crostini and topped with a bit of sea salt. 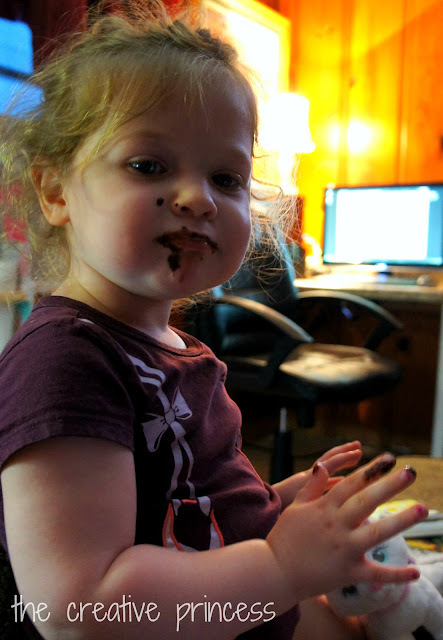 Hubby said next time he would prefer just a bit less chocolate (he is a man and is crazy), I liked all of the gooey chocolate. Next time I WILL use bacon on top though. That just sounds AMAZING! MG thought these were mmm...mmmm...good! 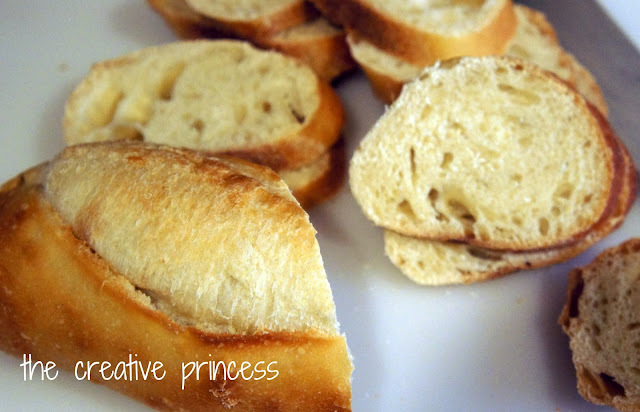 To make this all you need is a loaf of crusty bread, I used an Ecce Panis Petite French Baguette (they come two to a pack, I used the other baguette with dinner), olive oil, chocolate of your choice (I used Hershey's Dark) and sea salt. To see the complete recipe please visit this site, you will need to watch the video. To get a sneak peak at other recipes I will be featuring soon be sure to follow me on Twitter and like me on Facebook!